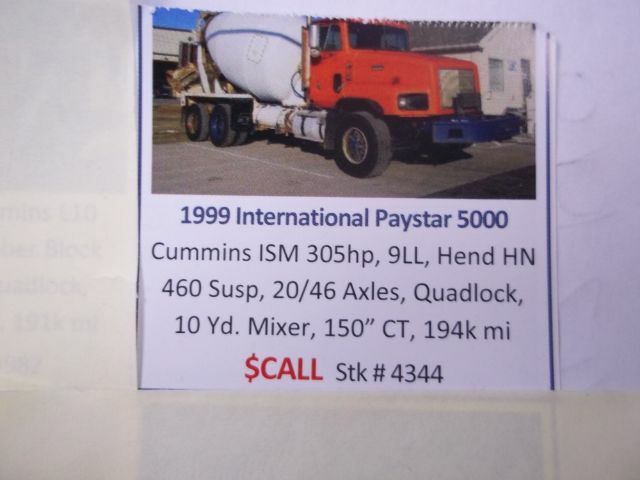 Please contact me regarding the 1999 International PAYSTAR 5000 ISM 305HP/9LL/20/46K AXLES - Stock# HEJ/J&M#4344 02/10/19 for sale at TruckerToTrucker.com. Take a look at this 1999 International PAYSTAR 5000 ISM 305HP/9LL/20/46K AXLES. It is Stock# HEJ/J&M#4344 02/10/19 at TruckerToTrucker.com. 1999 INTERNATIONAL PAYSTAR 5000, AIR BRAKES, VERTICAL EXHAUST, VISIBILITY WINDOW IN RH DOOR, EXTENDED FRONT BUMPER, 10 YARD MIXER, 150" CAB TO C/L OF TANDEM, QUADLOCK & OTHER OPTIONS. CONTACT HAROLD JONES CELL 717-446-1335 WITH QUESTIONS.